The photograph is well composed/framed. When I took the picture I thought mostly about color. Later I came to appreciate how well the branches filled the frame. I concur with the previous commenter. I love ‘up’ shots! The majestic red oak is the tallest tree on our property. Not sure how it (and one other, an offspring?) got here so many decades ago; there are no others like them we’ve been able to find. So the upshot of my photographing is that you and Michael (the previous commenter) are happy with it. It’s good to hear that a majestic red oak found its way onto your property—or chronologically speaking, that you found your way onto its. I wonder whether a former landowner planted the tree. Doubtful, as it was wild space before the developer began clearing for houses in the early 90’s. Perhaps a squirrel landowner? When we got the deed, the woods were thick with underbrush .. we knew there were big trees because we could see the tops, just couldn’t get to them until it was lightly cleared. Then WOW. Bur, post, red oaks, box elder, pecan — all tall canopy specimens — among others. Being a tree girl, we were certainly happy where we landed. All we need now is some mid-story plants like possumhaw and beautyberry. 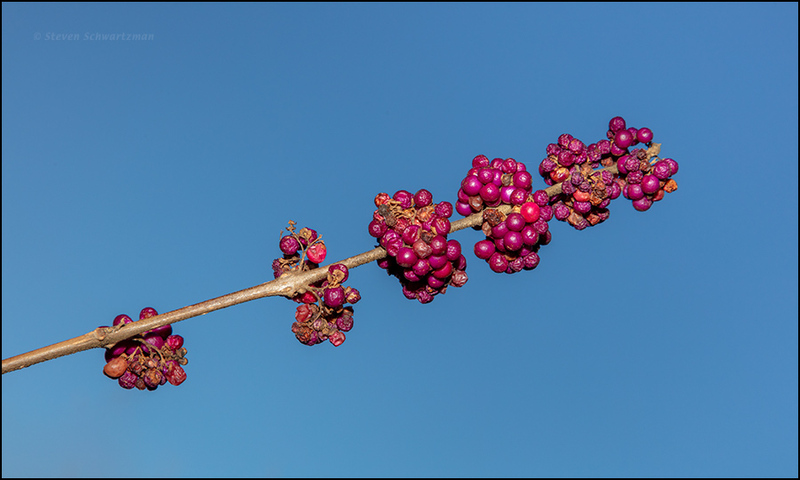 Possumhaw and beautyberry would be colorful additions for “tree girl” to branch out into. “American beautyberry berries become edible upon reaching full ripeness [,] which usually occurs in late summer to early fall. They should be a dark purple/magenta color but not turning wrinkled and dry. These berries can be eaten raw and have a mild, slight medicinal flavor. To truly maximize the potential of these berries it is best to make jelly out of them. Combine 1.5 qts of berries with 1 qt. water, boil for 20 minutes and then strain out the solids. Add 4.5 cups of sugar and one envelop[e] of Sure Jell to the liquid. Bring the liquid back up to boil for two minutes, skimming off any foam. Pour the hot jelly into sterilized jars and seal. The resulting jelly has a unique flavor which reminds me of rose petals and champagne. “These berries can also be used to make wine. Being low in sugars it is best to combine American beautyberry fruit with something sweeter such as grapes or bananas, otherwise the resulting wine will be a bit weak and have an uncomplex flavor. I’ve forgotten (or perhaps never knew) where on Long Island you used to be. East Quogue, which is actually in the town of Southampton (as opposed to Quogue). East Quogue is a place I’ve driven through only a few times in my life. It’s so far east of Franklin Square (where I grew up in Nassau County) as to have been almost another planet. That red oak is sure pretty! Nice to see color in the trees. Our leaves are long gone already. It works in both directions: you had glorious fall color well before we had any, and yours is grander than ours. Texas red oak was one that I have never seen. It is native to the part of Oklahoma where I went, but I was not looking for it. The common red oak, Quercus rubra, happens to be a good street tree here. It does not make too many acorns like it does in other regions. From what I saw online, common red oak certainly lives up to its colored name. Because it is an oak, it happens to have reasonably complaisant roots, so works well as a street tree. It does not get too big here. However, I sort of wonder how bit they will get in another century. Another concern is that all the relatively young trees that were planted only since the 1970s or so start to reach maturity at the same time, and drop more acorns than we are accustomed to. I hope that they do not make any more than they do now. They do seem happy. It’s good to hear they’re seemingly happy. Would that we all were so. I love the yellow and orange against the blue! A blue background (usually a clear sky) is great for setting off warm colors. The first image makes me think of a richly brocaded canopy. I never would have thought of brocade, which seems appropriate now that you mention it. One of the great advantages of a slow but consistent leaf fall is that fewer leaves on the trees makes for a more even leaf/sky distribution. That’s what I like most about your first photo. Trees that are blocks of color against the sky can be lovely, but the interplay of blue sky and colored leaves pleases me even more. It’s always intriguing to see where beauty berry lingers and where it doesn’t. I’ve always wondered whether growing conditions can affect the taste of such wild berries, and whether birds and other critters decide to eat, or not, depending on the taste. There are sour grapes and sweet grapes of the same variety, so it might be possible that the same is true with these native berries. You make a good point about the slow but consistent leaf fall producing an even distribution of leaf and sky. 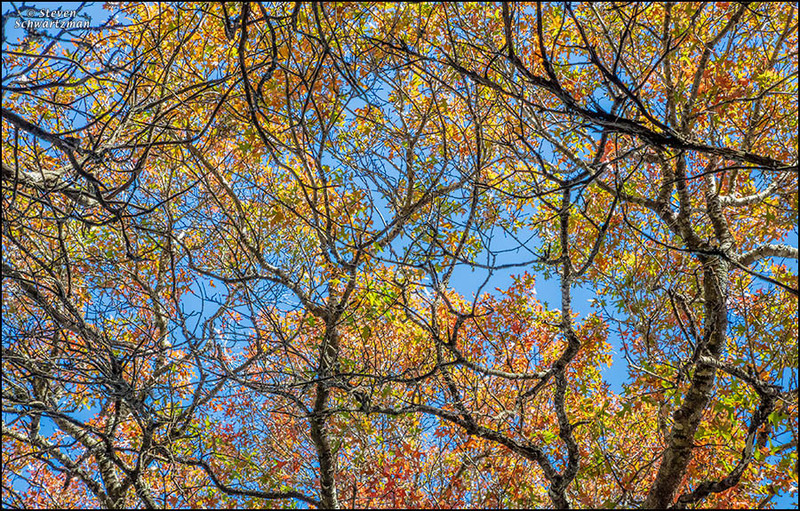 I appreciate the variety of colors in the leaves, while at the same time liking photographs of oaks I’ve taken in other autumns that show blocks of red against the blue sky. As for the beautyberry, you raise a good question. One online recipe for beautyberry jelly that I found yesterday said to avoid any little fruits that have begun to shrivel or dry out, presumably because they no longer taste as good. If I encounter any remaining clusters, I may have to start sampling to see what I find out. That red oak photograph is stunning. I love that the oaks are the last to show up in the spring, seemingly taking sweet time to leaf out, and then in autumn are the last to display color and let go of their foliage. They’re like late party comers, that end up closing down the show. For several years I noticed a beauty berry bush along the old river channel path I took on my route to the big river. This year I looked and could not find it – not even any dead brush. I know the new neighbor had fence repair done, but I thought I might have seen where the workers may have cut or sawed it off. Nothing! I know many folks around here have it planted in yard landscaping, but I’d never seen it grow wild like I did along the old river route. It’s such a beautiful and striking plant! I’m sorry to hear the beautyberry along the old river channel vanished like that. Let’s hope it just as mysteriously reappears, bears lots of fruit, and resists disappearing again. That’s just how I felt about this view. Up, up, and a way to portray nature.